Prints are on sale until the 28th! 8×10 and 8×11 prints are $4.00 each! 17 × 11inch prints $8 each, 2 for $15! Check out the Illmosis.net prints page to see the full selection of prints! The Karnov/Bad Dudes update from a few days ago wasn’t all I had for show and tell for this week. Shamelessly timed with their live-action premieres this week, it’s time for visits from the Justice League and the Punisher! All new sprites were also added to the GFX Generator. River City Ransom: Underground is on sale for $9.99 on Steam until November 20th, 2017! I’ve been disappointed by a lot of video game comebacks, but I’ll never pass up a chance to praise RCR:U. There’s a character for just about every play style and has the depth of a one-on-one fighting game. If you need a story as an excuse to have a good time, don’t worry, there’s a story in there, too. If that isn’t enough for you, they’re getting ready to make the game moddable. It’s easily one of the best beat ’em ups to hit the streets in years and well worth a buy. Not all the new things this week are bleak or hostile. This Wednesday was the debut of Tiny Bird Garden, a mobile game by Super Retro Duck that lets you befriend the cutest crew of birds you’ll ever meet. If that sounds fun to you, check out the game’s site and give the game some love! 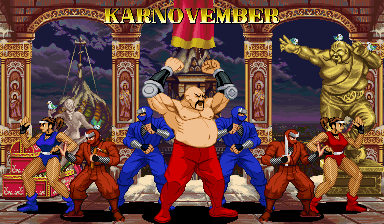 Karnovember is in full swing on Tumblr and Twitter! It’s time for this site to pay a little tribute to the legend that is Karnov and a few of his friends. 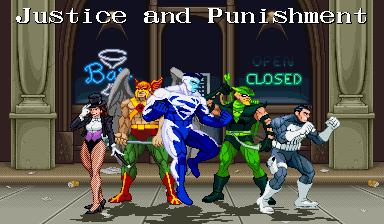 New customs sprites of Karnov, Zako Ninja, and Buki Ninja, and improved Kunoichi sprites have been added to the Bad Dudes gallery and the main GFX Generator. Speaking of the Custom Sprite galleries, I did a lot of behind-the-scenes work to just about all of them and a few look a bit different. Metroid and Transformers now have their own galleries and other games will get their own pages in future updates. I’m working on something that will replace a lot of the coding on this site, but I’ll explain that once the first upgrade hits. Stay tuned, there’ll be more small updates very soon!